The Panamanian golden frog is Panama’s national animal. Pictured on everything from T-shirts to lottery tickets to magazines, the tiny frog represents good fortune. For many years, the frogs were captured and taken into hotels and restaurants to promote tourism, as well as placed in people’s homes for good luck. But the frog's good luck seems to have run out with the spread of a fungal disease called chytridiomycosis, or chytrid fungus, which has wiped out golden frog populations. Sadly, the species is now believed to be extinct in the wild. The tiny Panamanian golden frog may be gone from its native forests, but it is found in managed-care facilities throughout North America, working to keep the species alive and healthy. Panamanian golden frogs' home habitat is in both wet rain forests and dry cloud forests in the Cordilleran Mountains of Panama. A fast-flowing stream suits them best. They typically go out and about during the day, hunting for small insects to eat. You might think it would be dangerous to be a bite-sized animal parading about in the sunlight, but the Panamanian golden frog is brightly colored to warn potential predators that it is very toxic and would be dangerous to eat. Its distant relatives, the poison frogs of South America and the mantellas of Madagascar, also use their bright colors to announce to the world that they are toxic. Adult males and females have similar coloring: light yellowish green to bright gold. They usually also have one to several black splotches on their back and legs, though sometimes there is no black at all. The females are much larger than the males: up to 25 percent longer and heavier. 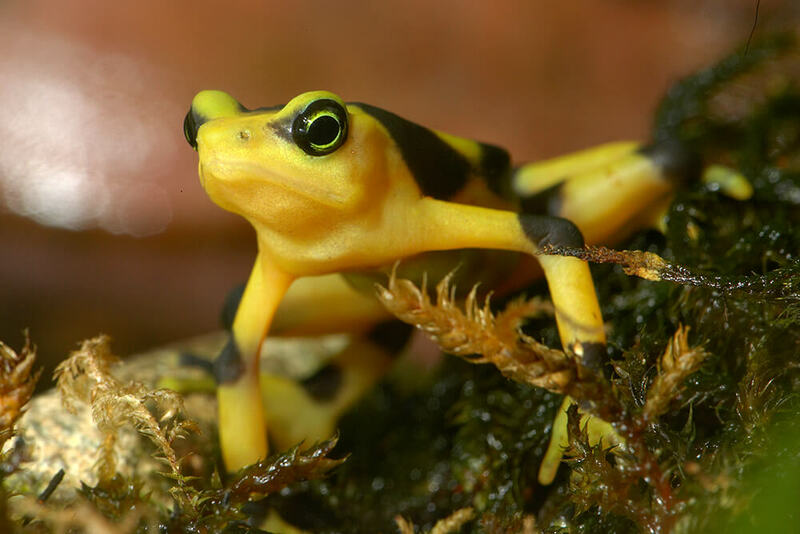 Poison can keep the Panamanian golden frog safe, and its diet helps make the animal toxic even to the touch. In fact, the more different kinds of insects and invertebrates the frog eats, the more toxic its skin secretions become. All animals in the golden frog's taxonomic family, Bufonidae, have toxic skin secretions for protection, but the Panamanian golden frog's secretions are the most toxic of the entire group. In fact, the frog’s toxins are so unique that scientists define the Panamanian golden frog as a distinct species! At the San Diego Zoo, Panamanian golden frog tadpoles are fed a powdered growth food, algae tablets, and fish flakes. Morphed froglets get fruit flies and pinhead crickets. As the frogs grow, they are fed progressively larger crickets dusted with reptile vitamins and fruit flies. Male Panamanian golden frogs make a whistling sound and have at least two different kinds of calls loud enough to carry into the forest from their home near the water's edge. This is a very interesting behavior, since the frogs have no eardrums and the rivers where they live can be very, very loud. So, how do they communicate? Like many humans who lack the ability to hear, golden frogs use a form of sign language to signal to one another. They "wave" their hands or raise and move their feet to defend territory, try to attract a mate, or even to greet one another. Researchers continue to study and learn more about this unique method of frog communication. Once a male Panamanian golden frog has attracted a female’s attention and she ambles into his territory, he climbs onto her back and holds on tight. She finds a shallow, shady place in the nearby stream and produces a long strand of cream-colored eggs, which she attaches to a rock or pebbles to keep them from being washed downstream. As she lays her eggs, the male fertilizes them; tadpoles hatch out about nine days later. Sometimes, a male hangs on to the female for several days until she lays her eggs. Talk about persuasive! 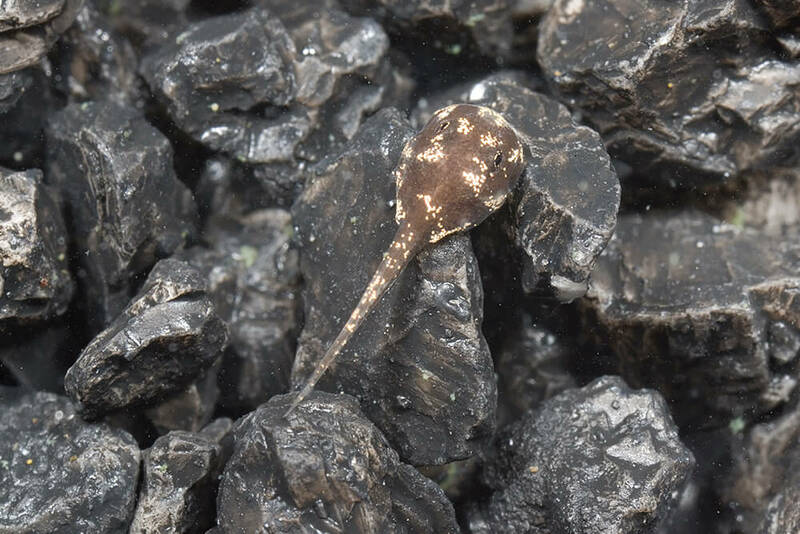 Newly hatched tadpoles are white, changing to dark brown or black with golden flecks (which is great camouflage) after a few days. They have a large, disk-shaped mouth with several rows of teeth that help them hang on to rocks when the stream picks up speed after a rainstorm. The tadpoles spend their early days eating algae from the rocks near the hatch site. They spend six to seven months eating and growing. Youngsters are much more secretive than the fully toxic adult, hiding until they can protect themselves with their skin secretions. Once the tadpoles change (a process called metamorphosis) into juvenile frogs, they eat and slowly build up their toxicity, and their coloration changes to green with dark markings, matching the color of mosses growing on stones in their watery habitat. They gradually change into the golden colors of mature adults. The San Diego Zoo received its first Panamanian golden frogs in 2003. They came from the Baltimore Zoo in Maryland as part of a collaborative effort among scientific, educational, and zoological institutions in the US and Panama. Known as Project Golden Frog, the idea is to create assurance colonies for the species, which is now believed to be extinct in the wild. We have had a lot of success with the little frogs, and some of them can be seen on exhibit in the Zoo’s Reptile Walk. San Diego Zoo Global is working closely with the Panamanian government and other zoos to ensure the survival of this species. In fact, the Zoo has been so successful in its breeding efforts that we have been selected to house some extremely important “founders,” or wild-caught members, of the managed-care population as a safeguard for the species. These frogs are of great importance genetically to the breeding program, and it is an honor to be selected to work with them. Since 2003, when San Diego Zoo Global received 20 young Panamanian golden frogs, we have had almost 500 hatch here. However, no frogs will be released into the wild until the threat of disease from chytrid fungus has lessened. If you’d like to know more about the amphibian extinction crisis and what you can do to help, please visit the Amphibian Ark®. Some of the most important actions for saving amphibian species, like protecting the environment and raising awareness of the plight of animals, can happen from within our homes. The nerve toxin produced by the Panamanian golden frog is called "zetekitoxin” after the frog’s scientific name. San Diego Zoo Global has donated money to help establish a breeding facility for these frogs in their native country, Panama. 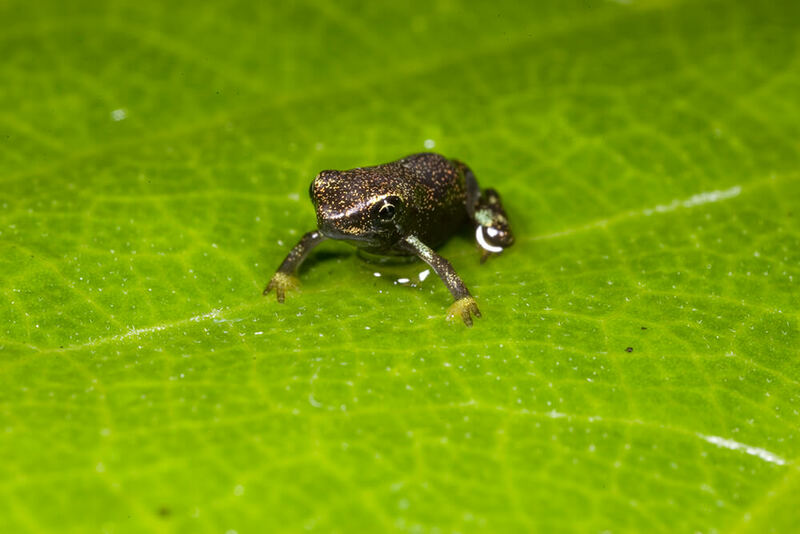 Project Golden Frog connects conservation organizations in both Panama and the U.S. in an effort to help these amazing little frogs.